Is this the start of a new Chinese approach to Southeast Asia? With the Philippines aligning itself more closely toward China and the election of President-elect Trump and the ensuing uncertainty about a continued U.S. “pivot to Asia,” China seems to have started laying out a new approach in dealing with its Asian neighbors. Recently, it has embarked on a charm offensive aimed at Malaysia, which led to the signing of 14 cooperation pacts worth RMB144 billion ($20.8 billion) including a major defense deal, and not least significant, the promise to handle South China Sea disputes bilaterally. On the other side, China has over the past two weeks shown Singapore it is not content with the way the Lion City has interpreted the “one China” policy while still cooperating with Taiwan. On November 23, the Hong Kong Port Authority (whether conscious of what the ship was carrying or not) selected to search an APL ship that was carrying nine Singapore Armed Forces (SAF) Terrex Infantry Carrier Vehicles (ICVs) and other military equipment from Xiamen to Hong Kong. The SAF vehicles were on their way back to Singapore after having been used in an overseas training program that sends up to 15,000 Singaporean troops a year to Taiwan to train following the Project Starlight defense agreement of 1974. While a “secret” agreement, it has long been public knowledge that the two countries cooperate on defense matters. Media have reported previously on deadly accidents involving SAF staff in Taiwan between 1993 and 2009 and it’s no secret that Taiwanese military personnel served in key positions in the early days of the SAF, including chief of air force and chief of navy. Singapore is a small but densely populated island, which makes it hard to conduct large-scale military training and exercises. Taiwan, with a much larger land mass, was therefore a good place for Singapore’s armed forces to train at a time when the city-state had recently become independent. Despite the fact that Singapore’s military has since established strong ties with other countries and conducts trainings in many other parts of the world, including Australia, Brunei, Germany, India, and the United States, the SAF continued its annual Project Starlight training in Taiwan. As could be interpreted from the high appointments of Taiwanese military personnel in the SAF, Singapore sees Taiwan as a friend that helped it build up its defense capabilities. Why did China only now decide to make an issue of the military exercises and cooperation between Singapore and Taiwan, after having known about it for many years? The timing looks particularly odd; why is China wooing Malaysia and the Philippines, among others, but simultaneously “punishing” Singapore? Sino-Singapore relations have been relatively stable ever since diplomatic relations were established 25 years ago. Singapore has always followed the “one China” policy, explicitly mentions Taiwan is part of China, and even now in this row over the ICVs refuses to name Taiwan in any of its public statements. To mark 25 years of diplomatic relations Chinese President Xi Jinping and Singaporean Prime Minister Lee Hsien Loong in November 2015 signed an agreement on an “All-Round Cooperative Partnership Progressing with the Times,” which calls on both countries to deepen existing and explore new areas for cooperation and collaboration. It is also the largest foreign investor in China, and was an early supporter to the Chinese-led Asian Infrastructure Investment Bank (AIIB) and the Regional Comprehensive Economic Partnership (RCEP). Despite these economic ties and the 2015 agreement, relations are not as rosy as they might seem. Singapore is not a claimant to the South China Sea dispute, but has one of the biggest ports in the world and any dispute over the South China Sea and freedom of navigation will therefore have its profound effect on the city-state. 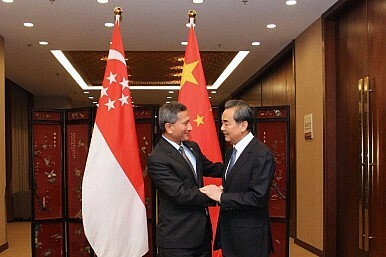 Singapore has advocated for ASEAN to play a role in the resolving of disputes, rather than China’s preferred bilateral negotiations. It also supported the recent verdict by the Permanent Court of Arbitration, dismissing China’s claims in the South China Sea. Finally, Singapore announced an enhanced Defense Cooperation Agreement with the United States, which led to the deployment of U.S. Navy P-8A Poseidon aircraft to Singapore. The latter in particular concerns China as P-8As could be used for maritime surveillance patrols over the South China Sea. With all this, China increasingly sees Singapore more as a U.S.-ally and less as a neutral actor. Singapore’s role is especially complex in a region where many countries have, despite their fine balancing act and initial pro-U.S. stance, started to move closer to China. After all, Beijing has not condemned the drug-related killings in the Philippines under President Rodrigo Duterte and is happy to invest in Malaysia despite the 1MDB scandal. Singapore, because of the move away from the United States by its traditional allies, has only become more closely aligned to Washington. The wedge that China is trying to push between Singapore and Taiwan is therefore part of a warning, telling the city-state it cannot continue to butter its bread on both sides without any consequences anymore. The affair will lack any major repercussions for Singapore in the short term. The biggest risk is the ICVs not being returned to the Southeast Asian country. It is therefore unlikely Singapore will bend to China’s wish to not cooperate with Taiwan anymore. It has enjoyed relations with Taiwan and the United States for decades, and its government is unlikely to make any major alterations to these relationships in the near future. China does not have much power to put Singapore back in line, as Chinese economic statecraft so far has been relatively unsuccessful. Singapore is also in a very different position from its neighboring countries as it manages an advanced economy and many international security relationships across the world. At the same time, China is still far too dependent on imports through the Malacca Strait to seriously oppose Singapore. The seizing of goods in ports can after all easily be done by both parties. This is not to say that the new and more assertive approach from China does not have any repercussions. China with this incident has shown it is willing to be vocal about what it sees as its inherent rights. Especially with an impulsive U.S. president, China will gain a natural advantage as a predictable ally for Southeast Asian states. The incident in Hong Kong can thus be seen as one of the first in a longer line of small crises through which China wants to redefine its role in Asia. Lieke Bos is a Project Officer at the Royal United Services Institute for Defense and Security Studies (RUSI). She holds a MA from the University of Warwick and a MSc from the S. Rajaratnam School of International Studies (RSIS). The views and opinions expressed in this article are those of the author and do not necessarily reflect the official policy or position of RUSI. LKY's efforts to balance between China and the US still shape Singaporean diplomacy, including on the South China Sea. Singapore's China ConundrumChina Protests Singapore’s Military Exercise With TaiwanHeng Swee Keat: The Future of US-China-Singapore RelationsThe Belt and Road Initiative and China's Southeast Asia DiplomacyCan Singapore Smooth China-ASEAN Relations?